I’d love to share this with you, because if you’re into soft and fuzzy with a side dose of hard reality and a well-deserved HEA, this one’s for your bookshelf. Personal tragedy and the loss of both parents at a young age made Ariela Perrine cross self-sacrificing hero types off her datable list. But Ariela is literally swept off her feet when an accident brings her face to face with an unforgettable pair of blue eyes, a playful smile, and an overly affectionate dog. Oh yes, journalist Dylan Bond makes her sizzle, but dare she risk it? After all, he’s just returned from covering conflicts around the globe. With his assurance he’ll be handling domestic stories from now on, Ariela’s weak resistance crumbles and their relationship intensifies at a dizzying speed. Then an unexpected phone call lures Dylan back to Iraq and he falls off the radar. His disappearance will test them both in ways neither expected. Will it bring them closer or destroy their fragile peace forever? “Please, come in.” Ariela grabbed her sweater off the hook on the wall and slipped it on, feeling a little underdressed in her pajamas. What on earth was he doing here, and how had he found her? Not that she was complaining. Oh no, far from it. He’d made a startling impression on her earlier today. When he’d smiled at her, she could have sworn his brilliant blue eyes were dancing like fairies at a midsummer frolic. Odder still, when he spoke she’d imagined butterflies circling her head. She’d heard tinkling bells. At the time, she hoped it was because of the knock on her head. Now she wasn’t so sure. Just looking at him again was doing crazy things to her mental and physical circuitry. The guy entered the apartment and gaped at the furniture right out of the sixties. Very familiar with this reaction, Ariela laughed. He shook his head, still blinking as he took it all in. He’d get no argument from her. They sat down and he looked pained when she settled into the bright tangerine-colored armchair. Understandable. It did clash jarringly with her pajamas—pastel balloons floating across a soft pink background. The poor guy blinked several times, seemingly trying to handle the color overload. Biting her lip so she didn’t break out laughing, Ariela tucked her feet up and gave him a slow, curious smile. “It crossed my mind,” she admitted. Even though she didn’t know him, there was something in his expression that made her believe he could be trusted, and more importantly, he wouldn’t have asked about her if he didn’t honestly want to know. The naked concern radiating out of his deep blue eyes transformed his handsome face into something miles beyond devastating. “I have a mild concussion.” Why was she blushing? “Good.” He broke into a full-blown smile and settled back on the sofa, apparently satisfied. She brightened. “Like in Bond, Dylan Bond?” She’d remember it now. “Dabbles in international intrigue?” She was toying with him, but it was fun. She read the pass, her doubts dissolving. “You actually live around here?” She handed the card back and he put it away. She laughed and his smile deepened. That dimple of his was growing on her. Ariela unfolded her legs and reached for the floor with her bare feet. When she rose he was right there with the card. Taking it, she noticed he was taller than she’d initially thought. She supposed that made sense. How well can you judge anyone’s height when you’re on your back? “When what?” She watched his eyes move as he took an unabashed tour of her face. Ariela closed the door behind him and fell against it. If she hadn’t locked her knees, she would have been a puddle of melting woman on the floor. As Dylan’s footfalls faded out and the back door shut, she pressed a hand to her excited heart. Something told Ariela that she was in for a wild ride with this one. Hell, just sitting in a quiet room with Dylan was exhilarating. Now she knew it wasn’t just the concussion. There was far more at play here. Scary. She was about to find out whether Dylan’s hands were capable and steady on the wheel, because he was already in her driver’s seat. She knew it, and judging by the look he gave her on the way out, he knew it too. Suddenly the Beatles were singing Drive My Car in her head. 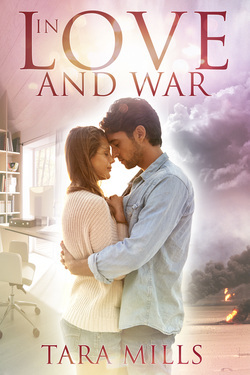 You can find In Love and War on Amazon. Tara Mills is a pampered wife, mother to three fantastic sons, one super daughter-in-law, and proud nana. She writes the stories she likes to read. Life is difficult. Love makes it bearable. Please visit Tara’s website Tara Mills Romance for more great reads and her quirky blog. She’s also on Facebook, Pinterest, and Twitter. This entry was posted in Stories Behind The Stories and tagged In Love and War, Tara Mills. Bookmark the permalink. Thank you, Terri, for sharing In Love and War with your readers and fans.